In a world crowded with ‘infobesity’ and bloated social networks we have to start addressing connectedness as a health problem. I have been energetically airing the issues around how we minimise the disadvantages of modern connected technology and maximise the way humans can thrive in a machine age for some time, calling these strategies and tactics Social Health. Social Health is what I call a successful strategic approach to how we connect with each other in times which are overcrowded with ‘infobesity’. The world’s soaring stress levels, stagnant productivity figures and cultural drop in trust and confidence in technology and social networks show that there is much work to be done. So when Arianna Huffington invited me to become editor—at—large for this new section on Social Health I felt honoured, of course, but I also felt that a huge weight had been lifted off my shoulders. Finally, the way we address modern connectedness and its opposite, disconnection, can be fully explored and shared very widely with people interested in strategy, change, innovation and personal development. ‘always on’ and fully connected. Over one third of the worldwide population will be using email by 2019. 95% of teenagers, according to a new Pew Research Study own a smartphone and spend half their time not using it to speak but to be online. The number of us on social networks will swell in the same period to 2.77 billion. Voice recognition AI is just one of the pervasive and invasive ways in which connected technology will connect humans in the coming years. Some of the biggest companies in the world face massive data hacks on a regular basis, making true the prophecy nearly decade ago by Scott McNealy of Sun Microsystems that “you have zero privacy: get over it”. Society today is facing less of a gold rush than a sugar rush or a nicotine rush: We have given ourselves addictive behaviours and consumption which has to be changed. In less than a quarter of a century all of us have become saturated by technology, and now is the time to raise our heads with fresh eyes, fresh strategies, fresh conviction, to offset the effects of it. To be the mistress of it, not the servant. After the digital deluge, comes Social Health. Social Health means how we connect better, more meaningfully, to raise our game, to raise our self-esteem, to raise our trust in ourselves and what we can achieve. To have wellbeing which is productively rooted in knowledge systems, network science, and time management as well as mindfulness. It is exactly one year since I first called on the World Health Organisation to update its unchanged seventy year old definition on health. 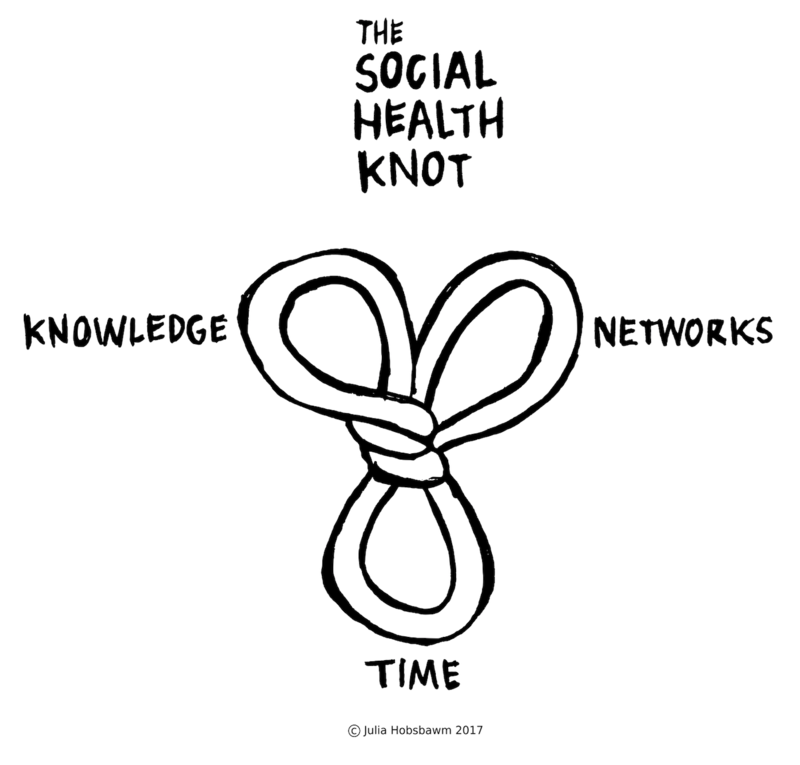 If I was adding ‘Social Health’ to the current WHO definition, I might define it like this: ”Social Health is the productive, functional flow of Knowledge and Networks, happening at the right Time (the K.N.O.T). Those with good Social Health know who and what to connect with, as well as the value of disconnection as a way of staying healthy. Social Health is a mindset and a behaviour that applies equally to individuals and organisations”. The launch of this site coincides with my first meeting with at the UN in New York to discuss how to best make that happen and the publication of my book Fully Connected: Social Health in an Age of Overload on why. This moment is long overdue but suddenly, we’re all ready to talk about Social Heath. Social Health is a vital bridge between physical and mental health, bridging the divide between drowning in data and curating conversations and connections through it; between learning from the best collaborations and calling out the worst lies we tell ourselves about what technology can achieve. Social Health is a bridge we are just beginning to build. Many hands are part of this movement. Many voices, such as the ten launch pieces on this site, are testament to the energy and innovation around Social Health. It’s all about change. One step at a time. Thanks to Arianna and her team at Thrive Global and for my contributors for taking this leap forward together. If you would like to contribute an article here or explore the issues further contact me here. It’s time for Social Health.